If you've never attempted spring rolls, you likely think it's more challenging than it actually is. It takes a few attempts to get used to handling the rice paper wrappers, but once you get the hang of it, you're gold. Today's combination of spring roll fillings has been a favorite this summer. 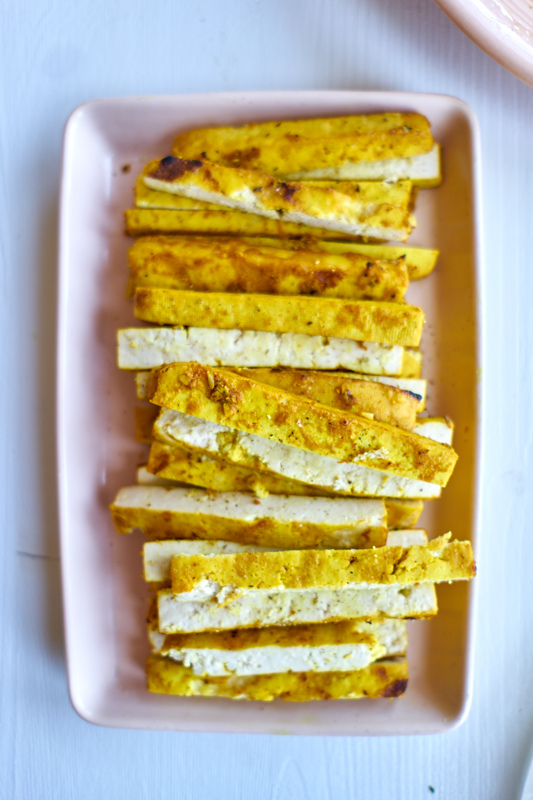 Grilled tofu coated with a golden, turmeric marinade is the base. The marinade is spiked with garlic and ginger and you can thin out any extra (with a bit of hot water) for a perfect dipping sauce. Herbs, asparagus spears, and a kiss of hot sauce fill the rolls out from there. The tip I wish someone had told me sooner is this. To soften up the wrappers they are dunked into a bowl of hot water. The mistake most beginners make is leaving them in the hot water too long. Dunk, count to three, remove. The wrappers will continue to absorb water as you're filling them, and they are much easier to handle when they aren't oversaturated and super-clingy to start with. You'll likely have a good amount of marinade leftover here. I typically use it to marinate something else immediately. Or(! ), I turn it into a quick dipping sauce for the spring rolls. This time around I added a couple of tablespoons of tahini to the leftover marinade, a couple pinches of red chile flakes, a big squeeze of lemon juice, and some salt. You thin it out with some hot water and a good amount of whisking. Taste, and adjust until it is to your liking. Voila! 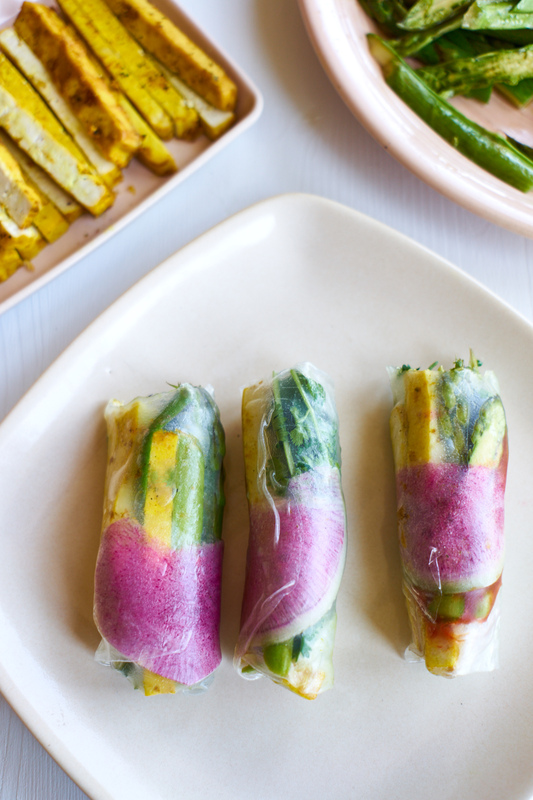 Because rice paper wrappers are semi-translucent, you can line them with beautiful ingredients and they will show through. 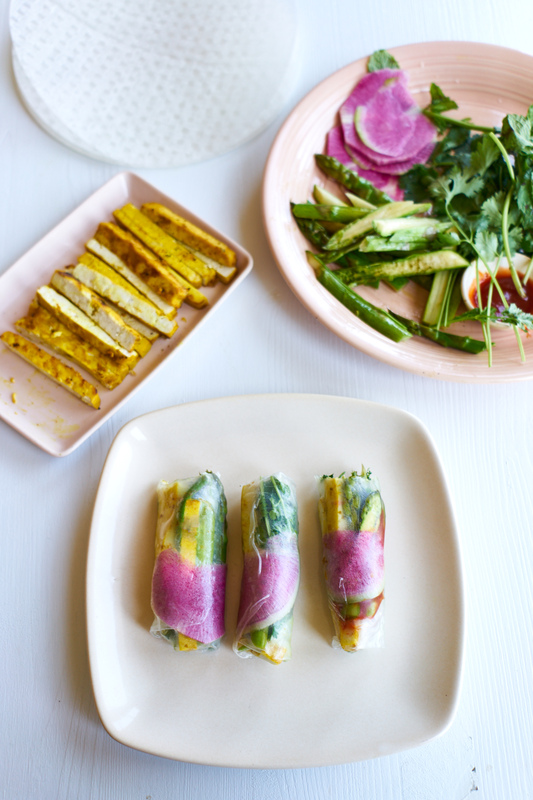 Here I use whisper-thin slices of watermelon radish and you get that pop of pink, but there's no reason you couldn't experiment with all sorts of leaves, herbs - basically anything pliable, and complementary to the other ingredients in your spring rolls. If you want to use cashew cream here in place of coconut milk, puree 1 cup of water and 1 cup cashews in a high speed blender until smooth. No need to strain. I love deeply caramelized onions in these spring rolls. To make them, heat a splash of oil in a wide skillet, add lots of thinly sliced onions along with a pinch of salt, and cook over medium-high heat, stirring occasionally, until the onions are deeply golden. You can make the onions up to a week ahead of time. More ideas: caramelized onions, sriracha sauce (or other hot sauce), grilled asparagus spears, fresh herbs (mint, cilantro, basil), whisper thin slices of watermelon radish. Whisk the lemongrass, garlic, and/or ginger with the turmeric, olive oil, and coconut milk together in a small container. Season with a bit of salt to taste. Combine the tofu and marinade in a shallow glass or stainless steel container, and gently make sure all the surfaces are coated. Allow to sit for at least 15 minutes. Place on a medium-hot grill, flipping once, until both sides are golden. Remove, allow to cool a bit, slice into pencil-thick pieces, and salt to taste. Use leftover marinade to marinate something else or make it into a quick dipping sauce (see main entry)! In bowl of hot water, dip each rice paper wrapper for just 3 seconds. Resist over-soaking, even if the paper is a bit stiff it will continue to absorb water as you assemble the wrap. Place on a flat work surface, and in the bottom third of the wrapper, arrange your ingredients. 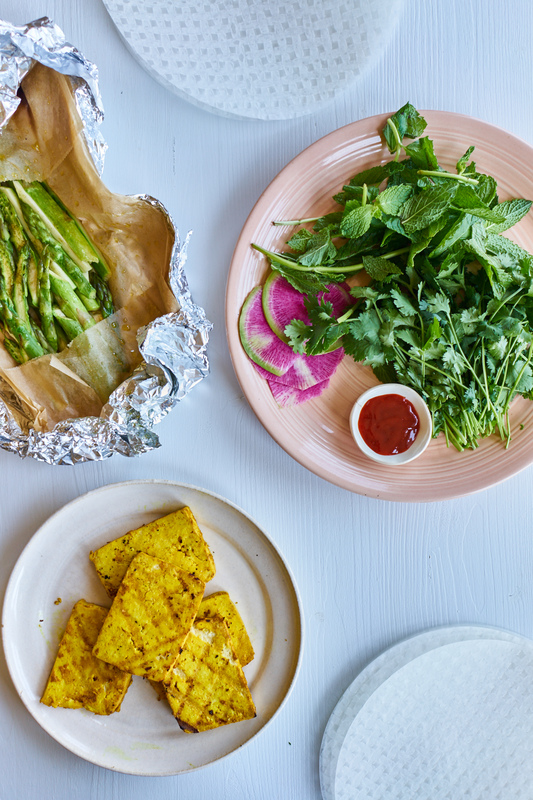 I like a thin slice of watermelon radish, smear of caramelized onions, tofu, a few asparagus spears, some cilantro, and mint leaves, and a line of Sriracha sauce (see photos). Then, tuck and roll, folding in the edges mid-wrap. If your spring rolls are sticking to your platter, dab a bit of oil on the plate before arranging the rolls.